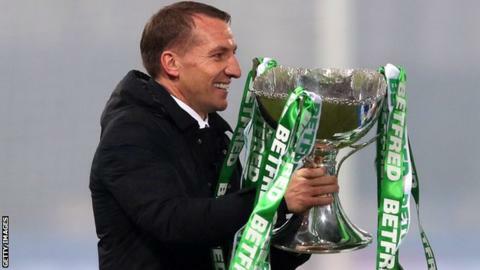 Brendan Rodgers says his third League Cup triumph is the "most satisfying" of the seven successive trophies he has won since becoming Celtic manager. Ryan Christie scored the only goal at Hampden as Celtic overcame stubborn resistance from Aberdeen. The 1-0 victory follows Thursday's Europa League success against Rosenborg in Norway. "We played against a tough team at the end of a tough week," Rodgers told BBC Scotland at the national stadium. "Probably of all the trophies that we've won, this is the most satisfying because it wasn't an easy start to the season for us. "The players showed that mentality and strength and talent. Big hearts they've got and now another trophy. "I take great pride in the fact we've now won seven trophies in a row, and it feels great, but my happiness is more for the players and the supporters. The players deserve a huge amount of credit because they've been amazing since I've come in." Match-winner Christie spent 18 months on loan with Aberdeen before returning to Celtic over the summer. The 23-year-old midfielder has enjoyed an influential run of games, scoring five goals and providing four assists in his past 10 appearances for club and country and earning a new contract. "I said to him that's the football gods," said Rodgers. "Aberdeen played a big part in his development. "He's come back and shown he's ready to be a Celtic performer and, the last two months, he's been amazing. He deserves the man of the match. "When I first came up here, he used to be Charlie Christie's son and now Charlie is known as Ryan Christie's dad. "To show the quality for our goal, which was probably our biggest moment of the first half, was very pleasing. We had a sequence of passes and worked our way through their man-marking and ended up with a great goal. "My only disappointment in the second half was that we could have been more clinical. In key moments, especially when we're having to defend a bit deeper, we broke away fantastic. "We broke with pace, and the support we had up there, we never made the last pass, which then makes the game a lot tighter towards the end than it should have been."